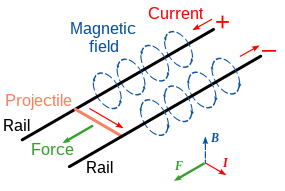 ↑ C. S. Rashleigh and R. A. Marshall, Electromagnetic Acceleration of Macroparticles to High Velocities, J. Appl. Phys. 49(4), April 1978. ↑ Fauchon-Villeplee, André Louis Octave (1922). "US Patent 1,421,435 "Electric Apparatus for Propelling Projectiles"". ↑ 4.0 4.1 Hogg, Ian V. (1969). The Guns: 1939/45. Macdonald. ↑ J. P. Barber, Ph.D Thesis, The Acceleration of Macroparticles and a Hypervelocity Electromagnetic Accelerator, The Australian National University, March 1972. ↑ Harris, William. 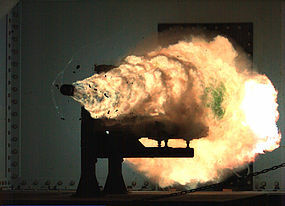 "How Rail Guns Work", 11 October 2005. HowStuffWorks.com. 25 March 2011. หน้านี้แก้ไขล่าสุดเมื่อวันที่ 13 กันยายน 2561 เวลา 10:39 น.